Also Perfection! Before Marc-Andre Fleury had even finished his shutout on Wednesday night, John Curry was already in the locker room celebrating his. Curry stopped all 29 shots thrown his way to pick up his first goose egg of the season, and the 9th of his career. Curry's mechanics were solid, his glove was quick, and Albany had no response for the solid saves he made throughout the game. And while Curry was dominating on his side of the ice, the Pens were chewing up the Devils on theirs. Andrew Hutchinson put the Pens up on the board less than 2 minutes in when he received a beautiful pass from Dustin Jeffrey and wristed it into a half-empty net for a PP marker. Then the two would flip flop a few minutes later, with Hutchinson making a solid defensive steal and finding Jeffrey for a breakaway opportunity that Dustin buried for a short-handed goal. The Pens kept the pressure on all night to a degree, but toned things down a bit after Jeffrey's 1st period tally to focus on their mechanics and defense. Chris Collins would make it a 3 goal lead in the third after he punched a rebound past David Caruso following a Boulerice shot. Caruso was not the original starter for Albany, who elected to go with Jeff Frazee instead. Frazee became injured sometime during the 1st period, and did not even take the ice to start the 2nd. Wins are always great, but the real highlight was the return of Robiturtle to Mohegan Sun Arena. Good ol' Louis was up to his usual tricks in the 1st period until Geoff Walker finally stepped in and dropped the gloves. 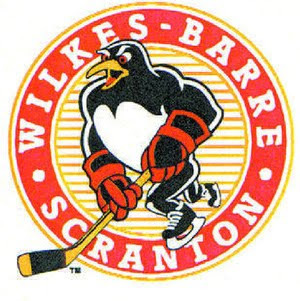 Robitaille surprisingly did not turtle but he did receive quite the pounding from Walker in front of a nice Wednesday crowd in WBS. Penalties were plentiful throughout the game, as the AHL was trying out some kind of double referee system for this game. Pens shouldn't get too stuffed with turkey, as they will be participating in Binghamton's annual Thanksgiving game tomorrow afternoon. Finish your dinner early and put Tom and Stoosh on the radio, as the game starts an hour earlier than usual.